You know about stinging bees and wasps but did you know that some bees like the carpenter bee can actually burrow into wood damaging your home? InspectorUSA Termite and Pest Control is the bee, wasp, hornet, and hive removal and eradication expert. At InspectorUSA, we specialize in 24 hour emergency bee services in the Central and Eastern Kentucky area. We solve the problem for you with fast and efficient services. Carpenter Bees Do Much More Than Sting! In the late spring to early summer you may see aggressive swarms of carpenter bees buzzing around your eaves or garage. 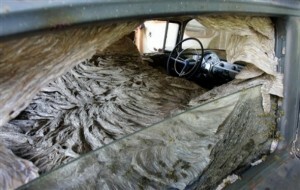 Now’s the time to take action before their wood burrowing instincts causes expensive damage to your home. Male carpenter bees can be very aggressive; dive bombing children, pets, and people as they approach the nest/wood burrow. Although the males do not sting, due to their large size they can be frightening. Female carpenter bees do have a painful sting, but more importantly both sexes of this bees will chew and burrow into wood causing serious damage to your home or garage. Typically these bees like to nest and overwinter in their multiple wood tunnels that have been chewed into unpainted or weathered woods. They particularly like redwood, cedar, cypress, and pine. Visit Wikipedia for photos and more information. 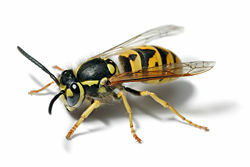 Wasps and hornets unlike bees can sting multiple times and do not die once they have stung a victim. This makes their control even more important for thriving spring and summer outdoor businesses like swimming pools, ice cream stands, snow cone stands, patio restaurants, and amusement parks or simply your back yard. On top of that wasp and hornet stings can be extremely painful due to the insect’s size and the amount of venom they can insert with each sting.